As readers of this blog will know, I've commented frequently on the "Microsoft monoculture" in South Korea, most recently in a December 2012 post. Consequently, coverage in the local press of Microsoft's latest Security Intelligence Report caught my eye as it contained more evidence of the negative side effects of over reliance on Microsoft software. As shown in a line graph from the report (click on the graphic to see a full size version), Korea ended the year with a malware infection rate of 93.0, much higher than the other locations with high infection rates. The report explains that the spikes in the infection rates were mainly due to increased detection of the rogue security software family Win32/Onescan. 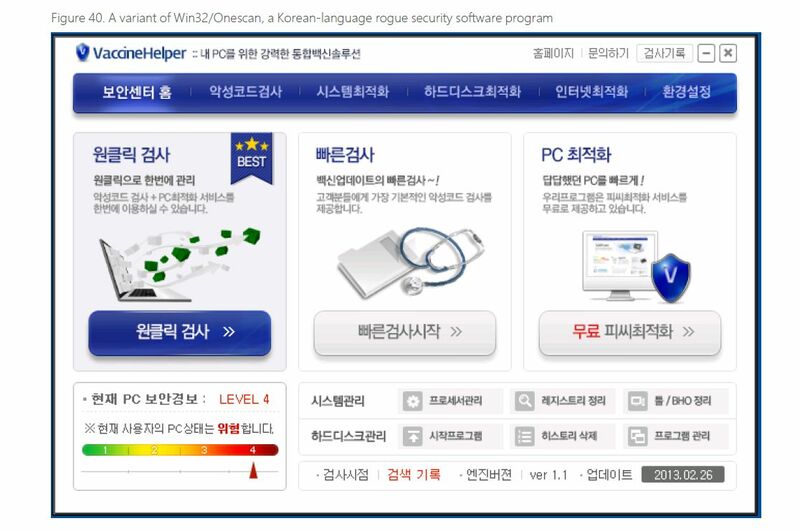 Onescan is a Korean-language rogue security software distributed under a variety of names, brands and logos. 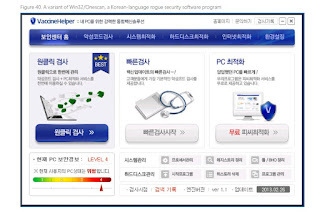 (click on Figure 40 from the Microsoft Report to see a full size version of the "VaccineHelper" example) In the fourth quarter of 2012, miscellaneous Trojans were found on 75.6% of all computers scanned in Korea. Furthermore, the report noted that Windows XP retains a larger market share in Korea than in most other large countries and regions.